Finished in 1848, the Farnsworth House sits on a 300-acre farm with family cemetery. 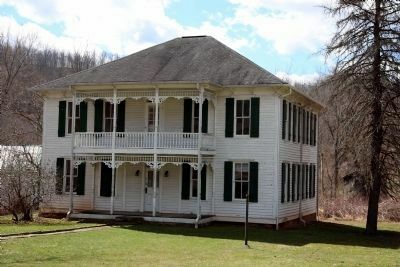 The house was built for James Farnsworth, brother of Daniel D.T. Farnsworth, second governor of West Virginia. A tavern was built to feed and house travelers, and a toll house was located here to collect turnpike fees. There was also a cattle weighing Station for drovers moving animals for sale in Weston. In addition to moving the stage safely across mountainous terrain, the driver also acted as baggage master, conductor and express man. Along the route, he was hailed and handed money with a request to purchase some article in the city. Did you know? Proper handling of the horses and the coach was an art that required much practice, experiene, and not the least, courage. Location. 39° 1.898′ N, 80° 47.009′ W. Marker is near Coxs Mills, West Virginia, in Gilmer County. Marker is on West Virginia Route 47 west of U.S. 33, on the right when traveling east. Touch for map. 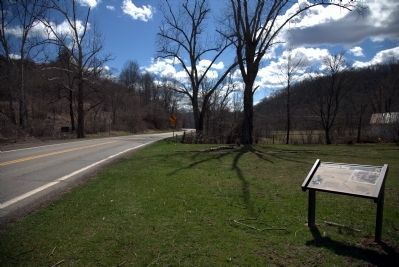 Marker is on West Virginia Route 47 between Coxs Mill and U.S. Route 33. 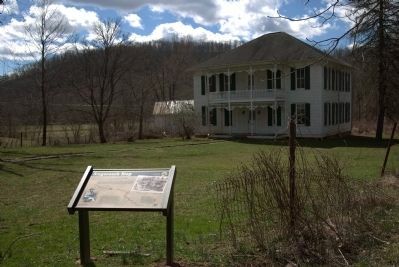 Marker is in this post office area: Coxs Mills WV 26342, United States of America. Touch for directions. Other nearby markers. At least 8 other markers are within 12 miles of this marker, measured as the crow flies. Samuel Lewis Hays (approx. 6½ miles away); Glenville (approx. 7 miles away); Duck Run Cable Suspension Bridge (approx. 7.1 miles away); Fort Moore (approx. 7.1 miles away); Attack on Glenville (approx. 7.1 miles away); Glenville State College (approx. 7.2 miles away); Glenville State Teachers College (approx. 7.2 miles away); Braxton County/Gilmore County (approx. 11½ miles away). More about this marker. A drawing captioned “Stagecoach - (1846)” is reproduced in the upper right of this interpretative panel. In the lower left is a drawing of a stagecoach driver published in Harper’s New Monthly Magazine in April 1972 captioned “From ‘The Mountains’.” The background image of the panel is a map of the Staunton-Parkersburg turnpike with the roadway highlighted in red. This is a private residence. Please do not trespass on the property. More. 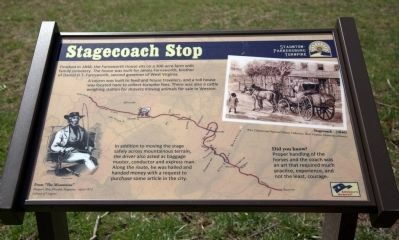 Search the internet for Stagecoach Stop. Credits. This page was last revised on June 16, 2016. This page originally submitted on April 1, 2015, by J. J. Prats of Powell, Ohio. This page has been viewed 375 times since then and 9 times this year. Photos: 1, 2, 3, 4. submitted on April 1, 2015, by J. J. Prats of Powell, Ohio. Editor’s want-list for this marker. Photos of the Farnsworth Cemetery nearby • Can you help?